Run Payroll and add employee by selecting Payroll under Employees. 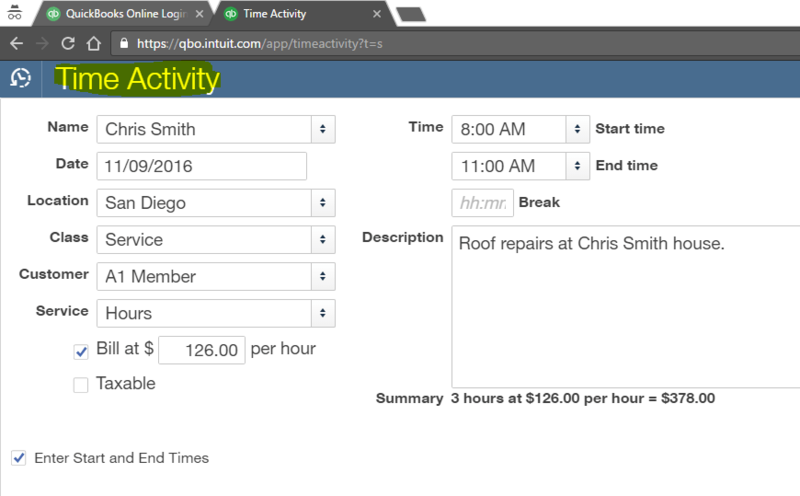 Enter a single time activity by selecting Single Time Activity under Employees. Need a plus plan for this feature. Fill in a weekly timesheet by selecting Weekly Timesheet under Employees. Need a plus plan for this feature. From here, you can run already set up payroll and also add an employee to run payroll. 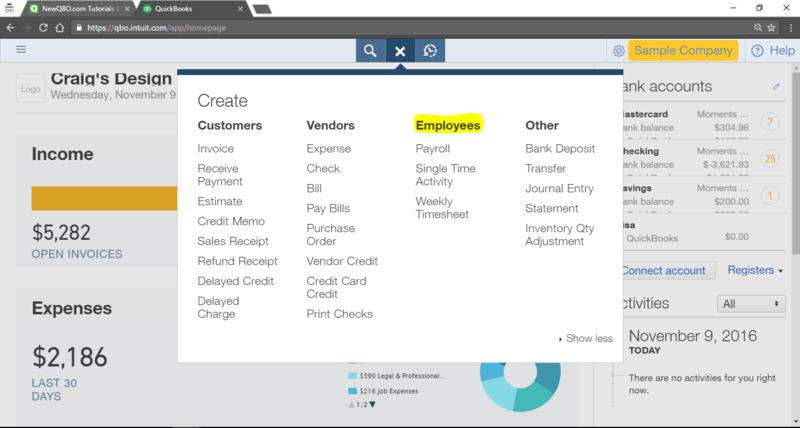 See Employee Center (homepage screen > left navigation bar . employees) for editing Employee pay, profile, and employment. Click Create (+) sign > Employees > Single Time Activity. Choose a name from the list. An employee or a Vendor name for Independent Contractor. Enter the date the activity occurred. Select a location/department. If you don’t see this custom field, see below for to enable location/department tracking. Select a class. If you don’t see this custom field, see below for to enable class tracking. Select a customer if you want to bill the activity to a customer or track expenses for a customer. If you don’t see this custom field, see below for to enable bills and expenses to a customer. Select a service. 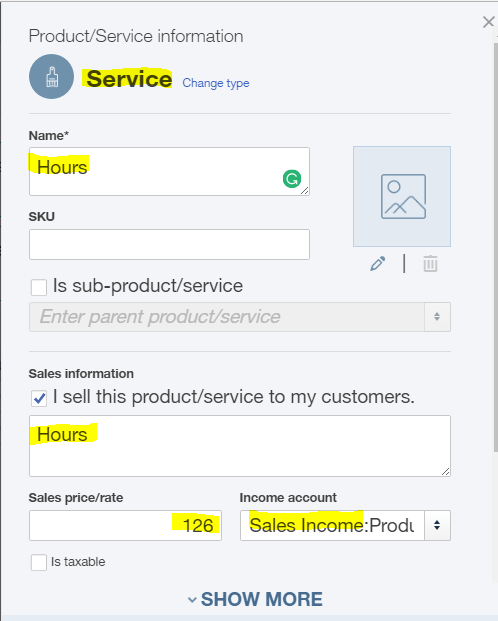 If you use services to enter time, choose a service that represents this activity from the products and services list. If you need new service item, see below for setup. If you are billing the activity to a customer, select the Billable checkbox. If you are allowed to change the rate at which an activity is billed, make sure that Bill at rate/hr is correct. Select Taxable if the activity is taxable. Enter the amount of time worked in Time. Or, select Enter Start and End Times to enter the time you started and ended work. For time break if any, select break time to subtract summary billable time. Enter description of the service type to override if necessary. Click Save and close (or Save and new to enter another time activity). See Custom Field Table below. Click Create (+) sign > Weekly Timesheet. Select the week for which you want to record activities. Description field. (Optional) Edit a description of the activity if necessary. If the activity is billed to a customer, the Description appears on their invoice, depending on your company settings. Text for the description appears automatically from the Sales Information field once you select a service item. Billable. If you are billing the activity to a customer, select the Billable checkbox. If you are allowed to change the rate at which an activity is billed, make sure that Bill at rate/hr is correct. For each day of the week this activity occurred, enter the number of hours spent on this activity for that day. You can add more activity lines if needed or clear all lines and begin again. To change First day of work week on a weekly timesheet form, see custom field table below. Note: If activities for this week are similar to last week’s, you can copy last week’s timesheet. To do so, click Copy Last Timesheet at the bottom of the form. From the home page screen > Company gear wheel icon at the upper right corner > Your Company > Account and Settings > Advanced > Time Tracking > First day of work week > Select Day from the list > Save.